20 miles on the Jeremy Ranch Road with Jake, Nathan Krah, and Josh - but mostly with Josh as Jake and Nate left us. 2:27 felt much easier than Monday. Great run. Rough day yesterday. After my long run with Jake, Nate, and Josh up at Jeremy Ranch, I mostly spent the rest of the day sick in bed or in the bathroom. Google "beet juice poisoning". I pretty much had all those symptoms. Still weak and depleted today. AM: Two miles with Abby, Andy, and Summit. Off to Alta High graduation now. PM: Four times around Liberty Park plus some striders. More running around Liberty Park plus striders. Last day of school. Year number 18 in officially in the books. Looking forward to a nice summer. Heading to Minnesota on Sunday to visit Ann's family and do this little race in Duluth. I'm also doing Jay Johnson's clinic for coaches in July in Boulder plus a four day AP conference at Cherry Creek High School near Denver. Abby had a sleepover last night and Ann had to teach a class down in Daybreak at the U hospital down there so Andy and I did a 3 mile walk with a little running. I'll give myself a mile. I think I've decided to run this race in Minnesota the week before Grandma's. Noon: 11 miles around Sugar House Park in 1:05:20. Ran the first and last miles in 8 minutes and the middle miles in the low to mid sixes. Warm. Liked my new Saucony Fast Twitches and my new Garmin Forerunner 15. Nothing like some new gear for motivation. Pleased to see my fellow Furman Paladin, U.S. soccer star Clint Dempsey, on the cover of my new Outside Magazine!!! AM: Four miles of walking/running with the family around Sugar House. Did Jay Johnson's "Core H" routine after. I think the H stands for Hell! Especially if you haven't done it for a while. Heading to the Fort Douglas museum for a Cub Scout activity with Andy now.70th anniversary of D-Day and probably the last "round number" one with a significant amount of WW II veterans around. PM: 6.25 on the treadmill at the gym during Abby's practice. 18.25 in 2:16:20 around the neighborhood, SHP, and the Highland track. Ran the first two easy and then kept it right around seven minute pace the rest of the way. Felt fairly easy and effortless. This was my sixth week over 70 miles since late March/early April. Last year I only had three weeks over 70 miles in the same time frame and they were way spread out. This year I've done six out of the last eight. PM: Abby and Andy and I walked to Chick-fil-a for lunch (3 miles) through the AWESOME new "Sugar House Draw". Then we went to Old Navy to pick up some really cheap clothes that were, no doubt, made by child labor in China. AM: Just an easy 2 mile walk. Heading to Minnesota now. AM: Easy 8.25 around Lusk Wyoming.Stayed at one of my favorite motels, The Best Western Pioneer Inn with this excellent chuck wagon omelette bar out by the pool area with your omelettes made by the motel owner in boots and cowboy hat and everybody getting their picture taken with him. Mimosa's too which would, no doubt, be illegal in Utah. 37 degrees on my run! Off to Mt. Rushmore when the kids get out of the pool - they were in the thing at 7:30. I have arrived....in Murdo, South Dakota! CAN'T BELIEVE I've lived almost 50 years and missed Murdo so far. Heading out to explore the town on foot now. PM: 4.5 miles around Murdo. Wow! I think I might be the first person to ever run here. The split racing shorts might have been a mistake. No morning run, but I did eat breakfast in Mitchell, SD, the hometown of 1972 Democratic presidential nominee George McGovern. Poor George failed to even win his home state in 72, winning only Massachusetts and leaving Nixon the other 49 states. PM: Treadmill fartlek in the fitness center here at the Raddison in South Minneapolis overlooking "The Waterpark of America" - supposedly the worlds largest indoor waterpark. Going to say no to the mall next door. Oh, and in an almost unbelievable coincidence, we also drove through Ceylon Minnesota, the boyhood home of former vice president and 1984 Democratic presidential nominee Walter Mondale also the victim of a 49 state drubbing at the hands of Ronald Reagan. At least Mondale won Minnesota. Pretty good workout actually with a little weights/strength training after. AM: 9.25 miles which included once around Lake of the Isles and twice around Lake Calhoun. It occured to me that when I lived here in 1993 and 1994 and circling Lake Calhoun was my daily running route, that in those pre--Garmin days I was pretty severely overestimating my mileage. This is where Ann and I lived 20 years ago when we got married. The neighborhood hasn't changed too much. Lots of our favorite places we went to when we were hip twenty-somethings are still here. Like the Uptown Diner which I contend is the best breakfast in America, no contest, and where I'll be brunching today. From Uncle Lauren's back porch we have, so far, seen one raccoon, many deer, and ONE BEAR this morning. Seriously, drinking my coffee, looked out, and there was a bear messing with the bird feeders in the backyard. Uncle Lauren's land runs right up to the St. Croix River which is the Minnesota-Wisconsin border and it's a wildlife paradise. No running today. Three hours of pushing a lawn mower should count for something though. AM: 5.25 miles on dirt roads in North Branch plus some striders then a couple more miles with Abby when I finished. She's running the 5k at Grandma's. Heading up to Pine River now after this Caribou Coffee stop. AM: Chilly, rainy, windy. I did 12.25 miles in 1:28 with miles 6-8 in 11:40 as kind of a race pace simulation. Felt good aerobically, not breathing too hard, but my legs didn't feel so great - not as fluid and effortless as I wanted the pace to feel. Not a disaster, but not the great effort I was looking for. I was kind of achy and tired from sleeping on the horrible matress at Ann's parents. Every year we swear we are going to buy a new bed while we are here so we can get a little sleep, but we never do. This has been going on for twenty years now. Two miles with Abby after. PM: 4.5 miles plus some striders and drills during a brief break in the rain. I think prehistoric Lake Agassiz is reclaiming this land. AM: 9 mile fartlek in 64 minutes. I did fifty minutes of 2 minutes "on" and 3 minutes "off" with a 2 mile run with Abby after. I also ran back and forth to the bridge a couple times while Andy was fishing. The 2 minute fast efforts were entirely by feel but probably ranged from half marathon pace down to 5k pace. Nice run. Went to town around lunchtime to use the wifi at the bakery. Closed on Monday. Then went to the library to use its wifi. Closed on Monday. Monday's seem to be an extension of Sunday here in Pine river. So I'm sitting in the parking lot of the library being happy that their wifi at least doesn't require a password. Did some grocery shopping and then stopped by Hardware Hanks with Andy and Abby to buy 2,400 BB's for the air rifle so they can blast away at cans and trees all afternoon. PM: 3 mile walk/jog for my mental health. Spent the rest of the day huling garbage to the dump and scrap metal to the metal recycling place. All from my in-laws rotting barn. Pretty good morning. Abby and I left early and drove to Pine River to do a workout on the high school track. I wanted to do a little race simulation workout so I laced up the racing shoes and did a warm-up the same way I would before a race. 2 miles plus some stretching and striders. Abby circled the track 17 times, mostly running, and then did 10 times up and down their tiny stadium. I did 2 X 1 mile with a quarter mile walk/jog recovery. Made it an actual mile, not 1600. The goal was to feel good running at race pace or a little faster. I ran the first one in 5:49 and the second one in 5:41. Felt good, but not quite as efortless as I hoped but that's usually the case with training so I'm not too worried. Besides, I'll have beet juice working for me on Saturday! Cooled down with 2 easy miles. I haven't done enough of thes workouts in the past few weeks and I haven't raced enough which will hold me back on Saturday. My mileage has been good though and I'm healthy so that's working in my favor. Went to the Pine River Bakery with Abby and got a cinnamon roll and cup of coffee and Abby got a cookie and milk. Then we walked around the whole town and talked about what it would be like to live in a town of 951 people in the middle of nowhere. Back home now with stressed out Ann who's trying to purge her parent's 40 years of crap to get ready for their auction. Easy four miles plus 4 super fast striders. 110% humidity this morning after last night's torrent. Saw a mama deer and an itty bitty spotted fawn bouncing across the road. Just a super easy shake out here in Duluth, Mn. I'll make my annual pitch for Grandma's Marathon and the Gary Bjorklund Half Marathon right now. I'm always surprised that more FRBers don't head out here for an early summer trip. It's one of the best races in the U.S. and Duluth is a surprisingly happening place and, when it's sunny, truly beautiful. The hospitality and organization are top notch. The temperature in Duluth tomorrow at race time will be 51 degrees - probably a couple degrees cooler along Lake Superior where the race is run. We checked in this afternoon. Abby picked up her packet for the William A. Irwvn 5k which is this evening at 6 pm and I went over to the "Elite Athlete Hospitality Room" to get my stuff and be waited on by a platoon of elderly volunteers. Lots of cookies for the kids. Interesting to see a couple Kenyans dumping a lot of the treats in their duffel bags. So, headed off to Abby's race soon and then an evening relaxing with out friends here in Duluth. Pretty ok race. I didn't race the last few miles nearly as hard as I should. Just didn't feel the intensity today. Still, I really enjoyed being out there in the best race hosted by a small city in the U.S. We always have a great time here staying at our friends, Wendy and Al Deibele, whom we have known since our days in Minneapolis two decades ago. They have a beautiful home, a great family, and an excellent wine cellar which almost was a major distraction the night before a big race. Ann made it out on the course to see me twice along with Abby (who ran 25:40 in the 5k last night!) and Daria. They kept me from fading any more than I did. Breakfast, as always, right after the race at Amazing Grace. Three pieces of french toast, two pieces of bacon, two sausage links, and two eggs over medium. I'm feeling good now. Just got back from a two mile walk arond the neighborhood. I think I have a great race or two in me this year. I can just feel it. 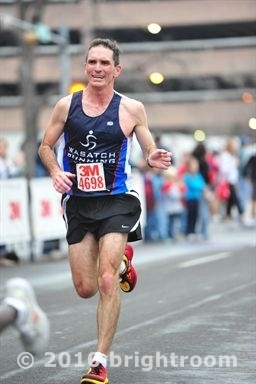 Hats off to Paul Petersen for his 2:17:54 in the marathon. I have tons of admiration for the way he just goes about business. No running. Drove from Duluth to Lincoln, Nebraska. The highlight was a visit to the Bob Feller museum in Van Meter Iowa. "The Heater from Van Meter". Took another day off. Drove from Lincoln to Laramie with lots of stops. Arrived home in Salt Lake after 16 days. Good to be back. I'll run this evening. 10.5 miles at Alta Ski Area. Spent a lot of time running back and forth on the road checking on the new kids and 9th graders - making sure they didn't die or get attacked by mooses or coyotes. Abby made it to the campground and back. 6.6 miles. Easy run in the gully. I'm feeling pretty beat up. I'm not happy with how slowly I 've bounced back from the race on Saturday. I had almost marathon like soreness for a couple days. Yesterday's Alta run left me pretty wiped out for today also so I'm taking it easy. Both knees are achy plus the left achilles. I'll stay on level ground and soft surfaces for a while. Hope to get in a couple quality runs over the weekend but I won't push it. AM: 3 mile walk around Liberty Park with Andy. Played on the playground and waded through the fountains for a long time after. PM: 4.25 miles at Liberty Park. Knees achy. Hips achy. AM: Push-ups, abs, core workout at the pool. Some people looking at me wierd. PM: 8.25 hot miles around the neighborhood. Just a bread and butter run. Felt better today but I cheated and took a couple Ibuprofins. I just realize that I seem to finish my runs on the quarter. Lots of my runs end in .25. I actually counted and I have 60 such runs in 2014. Easy run around downtown Sugar House, through the tunnel, around the park, and back home. Blah! Thinking of a new approach to my training. I just signed up for a race called the "Jupiter Peak Steeplechase". I thought it would be 3000 meters with some water jumps but apparently the trail running community has appropriated the word and in that world it means "a long race up and down a mountain" as best as I can figure. So I'm going to start training for this. I will do a mix of real running and trail running. Some guy named Rob Krar won last year in 1:45 which seems really slow for 16 miles. I think I will destroy him if he shows up again. PM: 3 miles of trail running in the rugged foothills east of Salt Lake City. Started growing a beard along the way. So today I ran the gully longer run by myself at 7 am Then I ran 1.5 solw miles with my new kids but I'm only giving myself 1.25 for the number of times I had to stop and walk with them. Then I went into the gym and lifted some and finished with a hard mile on the stair master. If anyone is interested in reading about this special place (the Alta Lodge and Alta in general), you can google "miles gone by alta my alta" and just click on the first reference. It will take you to a chapter in the conservative commentator, William F. Buckly's autobiography written just a few years ago before his death. He writes about his annual trips here with three friends including the Nobel Prize winning economist Milton Friedman. Even if you don't like Buckley's politics you will have to agree that he's a very good writer and captures the essence of this place perfectly.